While northern locales are rainy, wet and cold, the south of Turkey is still more or less sunny, warm and dry. 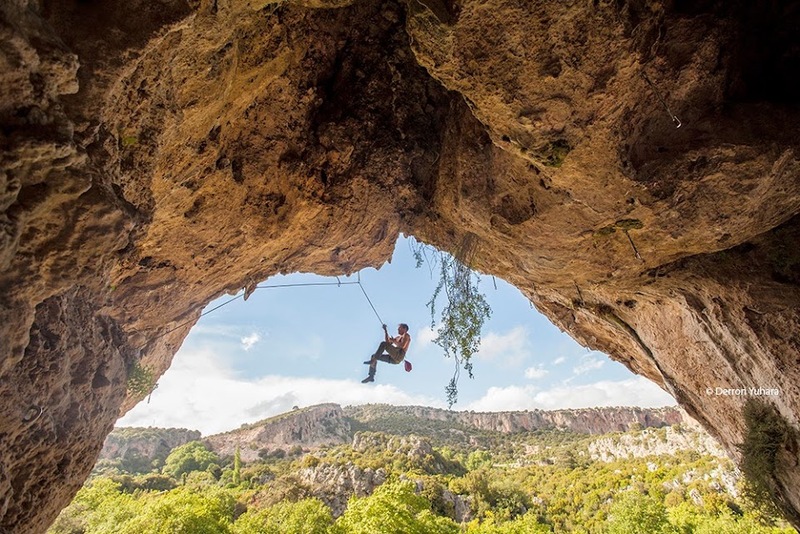 Most climbers in these cold countries turn to snow sports during the winter season, but Turkish climbers rejoice at the coming of autumn and the opening of the climbing season an hour drive outside of Antalya in Turkey. It’s the magical world away from the world: Geyikbayırı. Turkish speakers know that the name roughly translates to “deer slope.” “Geyik” meaning “deer” and “bayır” meaning something close to “slope,” “ramp” or “incline.” The name seems appropriate given the gratuitous herds of local goats that are the mainstay for the lives of many local people in the surrounding area. The fabled ibex- like endangered climbing animal, with curling horns that lives only in farther away undeveloped and uninhabited crags also gives credence to this name. 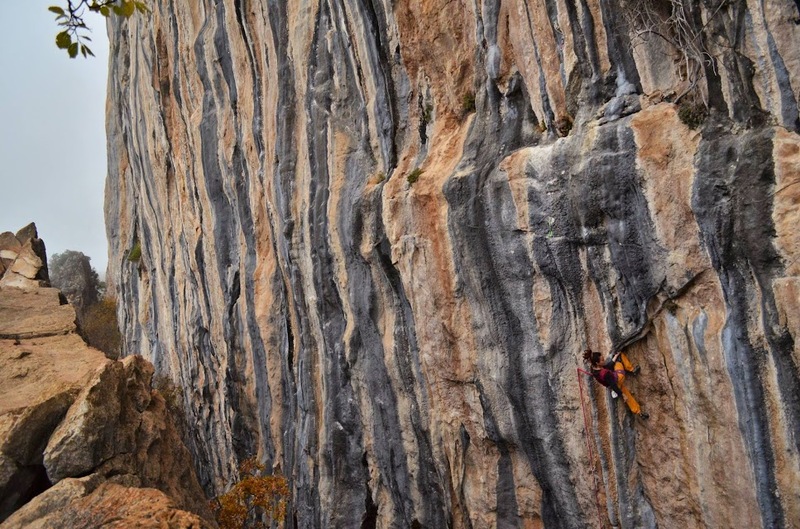 While there are many developing climbing areas in Turkey, Geyikbayırı is unique in the sheer number of open sport climbing routes—close to 1,000—within a very close geographic region. 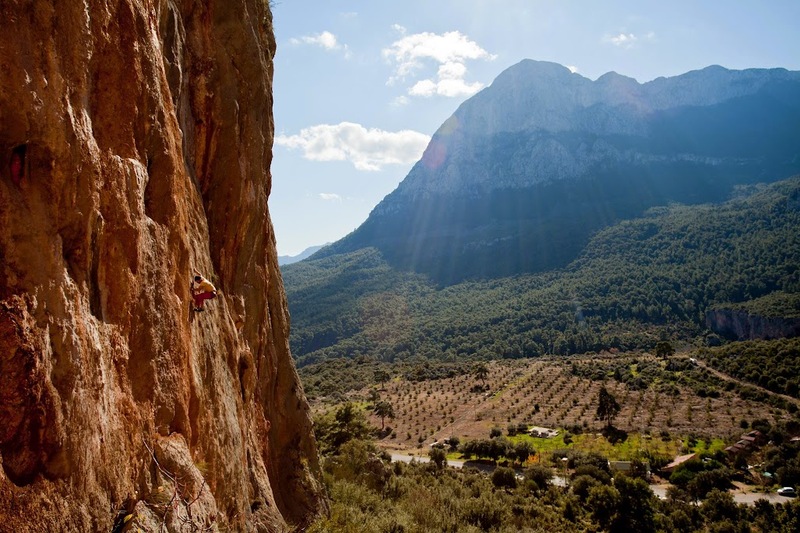 The crags are quite accessible and largest number of bolted routes on the European continent draws approximately 10,000 visitors from across Europe and the world per year. The rock itself, a large expanse of limestone carved into the mountainside, offers climbing for all preferences and capabilities. From slab climbing, featuring delicate and balance-y moves, to massive overhanging tufa columns, mega-columns and roofs. The majority of routes are single-pitch, although there are also a few multi-pitch and long routes. 70-meter rope is the maximum length recommended for this area at present date. Everything you need to know can be found in Öztürk Kayıkçı’s A Rock Climbing Guide to Antalya, written in English and Turkish. The fifth edition of the book just came out in 2014, with new and improved maps, pictures and updated routes and grades. The guidebook is on sale at accommodations in Geyikbayırı.As the area also boasts several caves and the exposure is both East-facing and West- facing, most weather conditions, heat or rain, do not discourage the motivated climber. Since the area has developed mainly over the course of the past fifteen years, the equipment on many of the routes is new and in good condition. The active local climbing community routinely maintains and checks the condition of the equipment and the rocks. The best time to visit is early spring, from late February to the end of April, and fall, from October to December. Locals and long-term travelers still climb during the winter months, although a rainy week can make most routes slippery and wet. The intense heat and humidity of the summer months tends to push locals and tourists toward the Mediterranean coast, just an hour away. Nestled among the sectors, several camping, bungalow and guesthouse places have taken root. Each place draws a slightly different clientele based on budget and sociability preference. From personal experience, it is possible to arrive without a climbing partner and find a partner or a group to climb with from the campsite. JoSiTo Camp has this particular friendly reputation. Other options closest to the crags include: Rido Camping, Peak, Kezban’s Guesthouse and Climbers Garden. Petzl RocTrip 2014 chose Rido Camping as their base camp, which like other places offers either campsite or accommodation in a bungalow. The friendly local business competition between the campsites keeps the quality of services and campsite maintenance high. All places have toilets and showers (with varying degrees of hot water) and typically offer breakfast or dinner for an added fee. Most accommodations also offer airport transfers directly to the camp for approximately 40 euro per person if arranged ahead of time. Getting to Geyikbayırı, although remote, is also fairly painless. Arrivals to Antalya airport or bus terminal are simple as both flights and bus trips are frequent on a daily basis from Istanbul and international ports. From Istanbul, cheap flights from Pegasus Airlines, Atlas Jet and sometimes Turkish Airlines can get you there one- way for between 40 and 100 Turkish Lira (about 12 to 35 Euros) during the late fall and winter season. Bus tickets one-way from Istanbul cost between 65 and 90 Turkish Lira. You can check Obilet for finding bus tickets. Once in Antalya, the path of least resistance, but also the most costly option is to arrange the airport transfer with your accommodation. If arriving late at night, it also might be the safest option. Renting a car is also a convenient option. For the budget traveler, it is also fairly simple to continue from the bus terminal by local minibus until Akdamla (the closest village downhill from the climbing area). Minibuses pass about every half hour. Locals are often very kind to hitchhikers, as the Geyikbayırı bound bus that passes the climbing area only has three journeys a day (around 7:00, 12:00 and 17:00). If coming from the airport, an extra bus (number 600) is needed to reach the bus terminal, otogar, or the Havaş shuttle to the Migros in Konyaaltı where you can continue the aforementioned journey. Simultaneous with the PetzlRocTrip 2014, marked the opening of Masal Refuge (by the same owner at JoSiTo Camp) and the brand new climbing sectors in Çitdibi (chid- ee-bee). 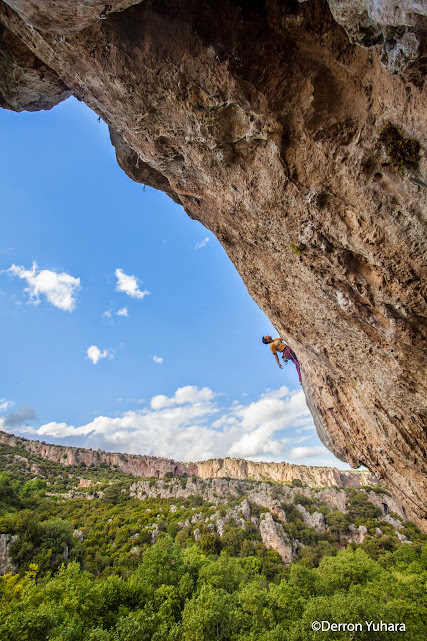 A little more than 15 kilometers (about a 30-minute drive) from the village of Akdamla, Çitdibi is rumored to be the new location for super hard climbing. 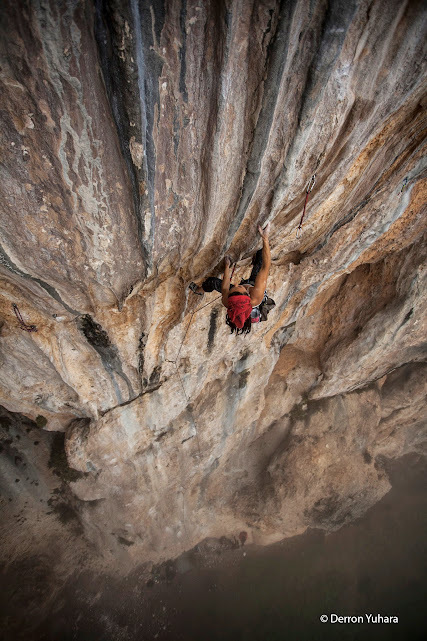 Most of the 70 routes are 6c+ and above (except for three 6a warm-up routes on the left side of the Kanyon sector). Some routes are still open for first ascents. 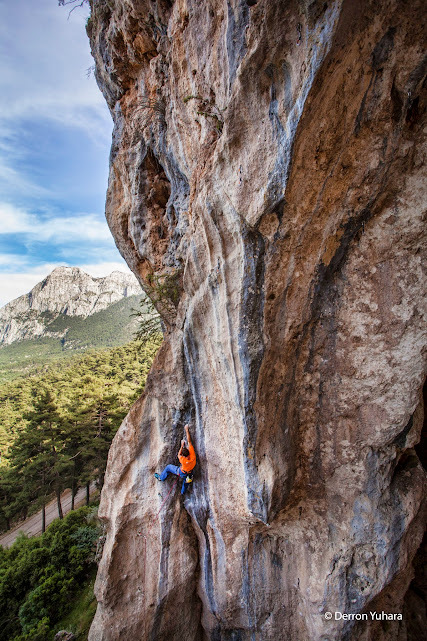 In addition to the difficulty of the grade on the beautiful orange and black-stripped tufa column lines, there are also a few long multi-pitch climbs. A 80 to 100-meter rope is the recommended length. The east-facing slope gets morning sun and afternoon shade can more details can be found again in A Rock Climbing Guide to Antalya. The camping ground at Masal Refuge is equipped with a kitchen-lounge and hot showers can be reached by car. If you will stay there, ahead of time registration is currently required as the campground does not have an on duty staff. Pre-registration and further information is available online at: http://www.masalrefuge.com. Over the past few years that I have spent living in Istanbul, Geyikbayırı has become like a home away from home and my escape from the things I dislike about living a big metropolis. As of December 4, 2014 late this last year, Departments of Energy and Natural Resources and Mining Affairs issued a mining permit that would allow irreparable damage to the most of the main sectors that lie on the specified 67 hectares of land. Should the mining for precious marble in the region proceed, the goat grazing grounds and local agriculture would be severely compromised and the local water source that feeds the surrounding villages and Antalya would also be endangered. 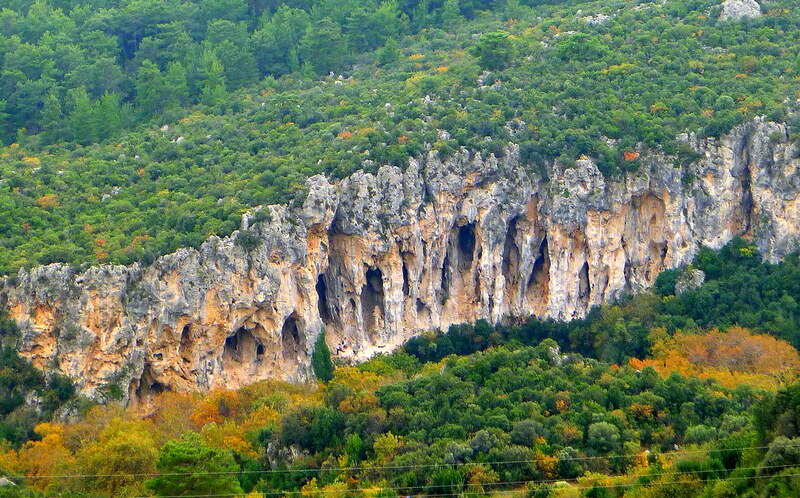 The eco-tourism centered on rock climbing and hikers on the Lycian Trail, a huge contribution to sustaining the local economy, would also dry up. I am outraged for all these reasons as well as the multitude of other ecological and social ramifications and my emotional attachment to one of my favorite places on earth. Fortunately, there is a growing grassroots resistance among the climbing community. The petition at Change.org has at the time of writing received over 9,000 supporters in one week. Link for the petition. Visit while you can and do what you can to support the overturn of this permit. 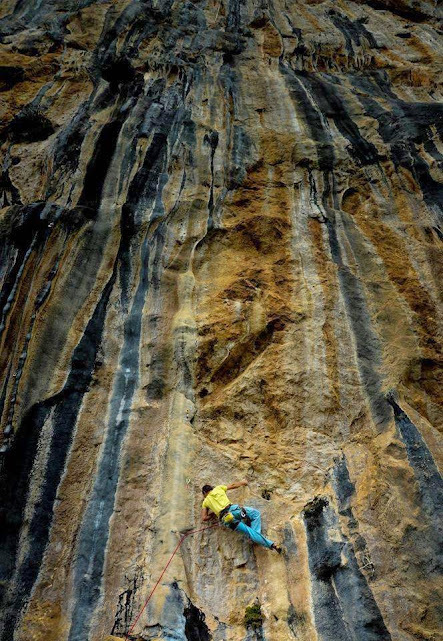 As the heart of the burgeoning sport climbing community in Turkey, the loss of this place is unimaginable. Experimental Performer, Occasional Teacher, Accidental Linguist, Casual Athlete and Climber, Secret Chef and Mixologist.